The Presbyterian Church’s decision last week not to divest from companies that sell equipment to the Israel Defense Forces in the West Bank was hailed as a victory for Israel and a setback for the Boycott, Divestment and Sanctions (BDS) movement. But the Church’s decision to boycott two Israeli companies — Ahava and Hadiklaim Israel — that operate beyond the Green Line, disappointed Israel supporters and was seen by some as a win for the BDS campaign. Following the Church’s vote, each side scrambled to claim that it won this round of the battle. But what does the Church’s decision really mean for Israel and the BDS movement? Is the boycott campaign actually working? • In June 2012, Morgan Stanley Capital International (MSCI), a top U.S. investment firm, disclosed that it had removed bulldozer manufacturer Caterpillar, Inc. from its index of socially responsible corporations. BDS campaigners said Caterpillar’s role in “Israeli human rights violations” was one of the factors in the decision. MSCI’s decision prompted financial retirement fund giant TIAA-CREF to divest $72 million in Caterpillar stock. A month earlier, Friends Fiduciary divested $900,000 worth of shares in Caterpillar. • The Norwegian Finance Ministry announced in June that the Government Pension Fund Global, a state fund that is Europe’s largest equity investor, would divest $1.4 million worth of shares from Israeli construction firm Shikun & Binui due to its construction projects in east Jerusalem. • Several internationally known artists and musicians heeded calls by the BDS campaign to cancel shows or avoid performing in Israel over the past year, including Jon Bon Jovi, Pete Seeger, Vanessa Paradis and Cat Power. • Student organizations at universities in Canada, Arizona and Massachusetts, among others, passed resolutions calling on university administrations to divest from companies that supply Israel with military equipment. • While it accepted a boycott of Israeli settlement produce, the United Methodist Church at its annual conference rejected a proposal to divest from three companies whose products are used by the IDF in the West Bank, following in the path of the Episcopal Church, the Evangelical Lutheran Church, the United Church of Christ and others that have rejected past divestment proposals. 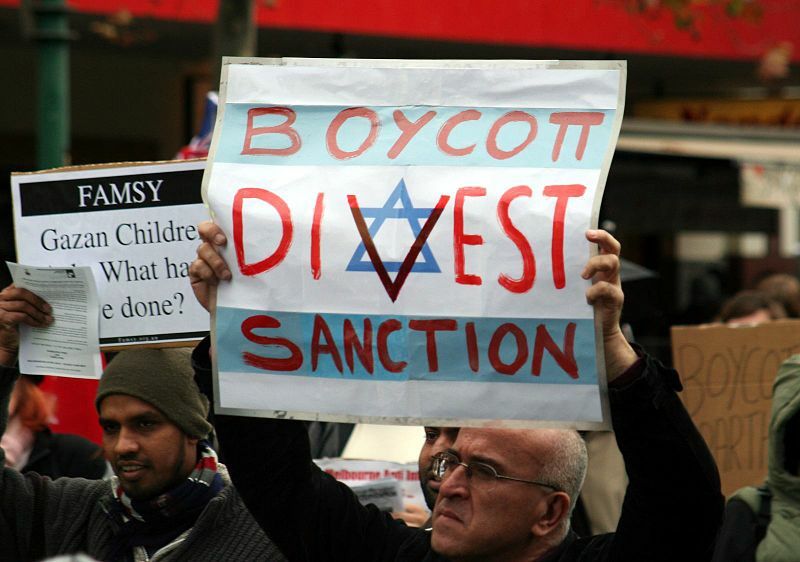 A closer and look at some of the purported BDS wins demonstrates that the movement is all bark but no bite. Photo by: Mohamed Ouda / Creative Commons Attribution. • In March, the Park Slope Food Co-op in New York rejected a motion to hold a referendum on whether to boycott products from Israel. • Despite many British BDS initiatives over the years, British Foreign Secretary William Hague said in March that commerce between the U.K. and Israel soared 34 percent in 2011 “The people calling to boycott Israel make a lot of noise, but their influence is very small,” British Ambassador to Israel Matthew Gould said in March. • Musicians such as Madonna, Guns N’ Roses, Ziggy Marley, and Justin Bieber, among many others, have performed in Tel Aviv over the past year, rejecting BDS calls to boycott Israel. • Despite the intense efforts of pro-Palestinian protesters to stop the show, Israel’s Habima theater company performed “The Merchant of Venice” at London’s Globe Theater in May. • In June, the Union of European Football Associations (UEFA) rejected calls to remove Israel as host of the 2013 European Under-21 Championship. Based on this list, the BDS movement’s battle against Israel is a whole lot of spin. Many have said this before me and many will likely say it after me, but it needs to be said, again and again, lest anyone thinks Israel is crumbling under the pressure of boycotts, as stories about often-exaggerated BDS successes in the international and even local media will have you believe. A closer and more informed look at some of the “wins” listed above will demonstrate that BDS is all bark but no bite. • All the supposed BDS victories surrounding divestment resolutions passed by university student organizations have never been able to make it past the final round. To date, not a single university has sold its shares of stocks that have been targeted by the BDS movement, or has adopted a formal academic boycott of Israel. Some even say BDS is losing steam. But every few months a story like this — about how the EU may be able to ban trade with Israeli settlements without being in violation of international law — will pop up and suggest that the BDS movement could be gaining traction. For now, at least, it seems the BDS movement’s impact on Israel will remain trivial. But BDS needs to prove its legitimacy much more than Israel does, and it will continue to employ PR tactics and whatever other means it can use to further its goals. Any purported victories added to the BDS scorecard should be taken with a grain of salt. « With this rabbinate, I thee wed?